Cal Fire firefighter Ryan Michaels greets Senior Executive Administrative Assistant Corrie Rudd who thanked him and all first responders for their work on the Loma Fire. 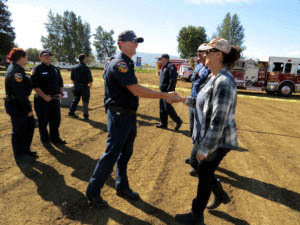 The South Valley community gave a hearty thank you to the fire crews who fought the Loma Fire that burned 4,474 acres in the Santa Cruz Mountains in late September and early October. Saint Louise Regional Hospital put on a special barbecue Oct. 23 to show the appreciation people in Gilroy, Morgan Hill and San Martin have for their service. The grassy hills and tree-covered mountains surrounding the South Valley can easily ignite into an inferno on hot summer or fall days, as what happened shortly before 3 p.m. Sept. 26 when residents of the region first saw a large plume of smoke rising around Loma Prieta peak 10 miles northwest of Morgan Hill. The smoke drifted south into San Martin and Gilroy, making it hard for some residents to breathe. At night, the line of orange where the fire fed on dry vegetation could be seen throughout the valley. Twelve single residences and 16 outbuildings were destroyed and a single residence was damaged. There were no injuries. 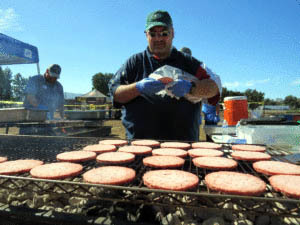 Marty Laguna, director of materials management for Saint Louise Regional Hospital, cooks burgers during a barbecue thanking first responders of the recent Loma Fire. Cal Fire Captain Mark Treichel said the fire on the first night “blew up” on some of his fellow firefighters and chased them off the hill. “We went up there to the staging area to back them (the Type 3 strike team crews) up if they needed it. And then when the fire started blowing up there and they were being chased off the road, they told us to bunk down to the structures,” he said. The rugged terrain and dry vegetation from summer heat made it hard to fight the fire, he said. Cal Fire battalion chief Ryan Michaels, based in Morgan Hill, said the Loma Fire was considered a serious one from the start so dispatchers called in the various fire-fighting forces to respond. “They knew right off as crews started arriving that it was going to be a significant incident, so they started ordering extra resources immediately,” he said. The barbecue held at Saint Louise Regional Hospital was much appreciated by many of the men and women who fought the fire. Country music radio station KRTY played tunes to entertain the fire crews and community members who came to thank them for their work. Four-year-old Isaiah James Becker raced to Michaels and gave him a firm handshake. With much of the vegetation gone, the fire-burned area now faces the potential of flooding of streams and landslides along steep hills if the region gets heavy rains this winter. An analysis of the watershed is now being conducted to determine where areas of erosion danger might occur. The Santa Clara Valley Open Space Authority has made requests to cover the cost of short-term and long-term fire response efforts. Nearly 2,000 acres of open space lands burned in the fire. Preliminary evaluation by authority staff show wildlife habitat and natural resources will require extensive rehabilitation and restoration. 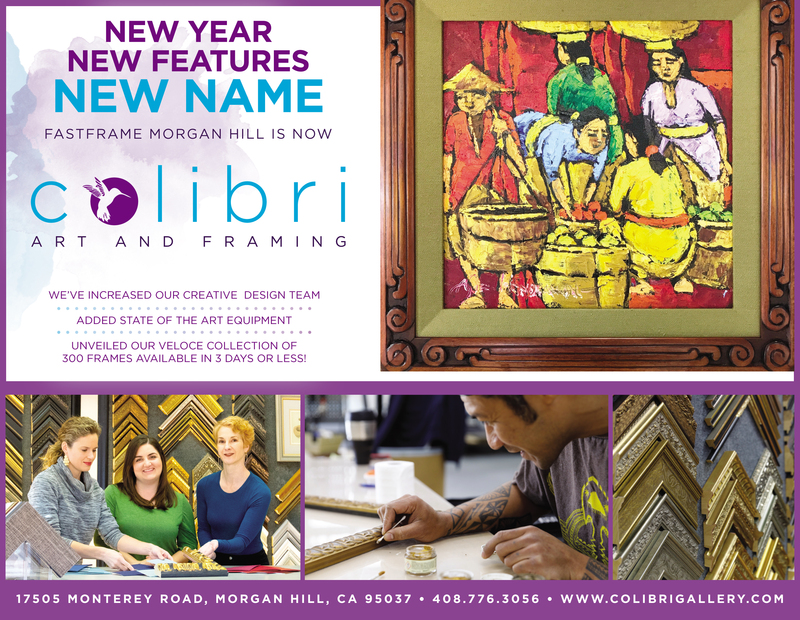 Immediate priorities include ensuring public safety from landslides and other hazards, barring illegal access — particularly preventing motorized vehicles from damaging exposed slopes — and reducing soil erosion and the flow of debris and sediment into the Chesbro and Uvas reservoirs. The OSA estimates that restoration and recovery costs may exceed $1 million. Its internal Loma Fire Response Team will manage the impacts on water supplies, trees, vegetation and wildlife, OSA General Manager Andrea Mackenzie said. The authority will seek partnerships and funding assistance for its restoration work from local, state and federal agencies. About 1,930 acres, or 43 percent of the land burned, were primarily upper watershed lands managed by the authority. The fire burned 1,500 acres of open space on Mt. Chual, on the east-facing side of the Santa Cruz Mountains, leaving steep slopes bare of trees and other vegetation in its wake. Due to wind and extremely dry conditions, the Mt. Chual area burned the hottest and consumed most of the trees, along with chaparral and other vegetation. OSA docents are preparing educational programs to help visitors understand what to expect over the next several years in terms of regeneration and restoration of vegetation and wildlife. Wildfire is a process that occurs naturally and is also practiced as a land management tool, said OSA Education Program Coordinator Teri Rogoway said. It can be beneficial to open space lands and even contribute to diverse species and habitat over time.